McMorrow soon realized that “education was the most potent arsenal in the fight to provide these pupils with a future to aspire to,” and her work since then has been focused on doing just that. Lena is one of the many amazing educators who will be traveling to Prague later this month for the Partners in Learning Global Forum, and we’re proud to share her story in today’s Daily Edventure. How did the environment in which you taught shape your approach to education? The level of social deprivation in the area was catastrophic, the statistics mind boggling. All I could hope to do was to show my pupils that there was a world away from the battles raging in their back garden, there was the possibility of going to college and university, and there was even the possibility of a career for some of them. I believed that there were two mountains to climb. First we had to change the curriculum to engage the pupils and challenge and widen their perspectives. Second, we had to work in partnership with what little industry there was in the town to ensure that we were providing the pupils with the skills that would form a platform from which to attract high quality investment and job opportunities. How did your work contribute to changes to education in Northern Ireland? In 1988, I was delighted to be appointed Head of Politics, Head of History and Head of Sixth Form. This was a period of rapid circular change as I worked as a subject advisor in the development of a new vibrant curriculum and assessment program for both these subjects. The focus was beginning to change towards “Citizenship and the Development of a Shared Future” for all the children of Northern Ireland. I was delighted to be able to make a contribution to the development of the curriculum, not just for our bright pupils, but particularly for our disengaged, under-motivated pupils. I was particularly proud of my contribution at Northern Ireland level to the development of differentiated learning strategies for our special needs pupils. I recently returned from a visit to Finland to research the strategies used. Finnish schools achieve the highest levels of literacy and numeracy in the world (PISA 2012) and I am in the process of disseminating this good practical throughout the 19 Colleges of the Foyle learning community. How has the transformation to education in Northern Ireland been recognized? My work with our partners was recognized by the Cabinet Office in London and I was interviewed by a representative and the interview was subsequently published. How did the lives of students at your school change? Through a process of critical self reflection, innovative teaching strategies and partnership development our school as an institution had been transformed. However, how successfully had I brought about a transformation in the life chances of our pupils? Certainly our pupils now had greater active participation in curricular initiatives across the whole community. My pupils regularly took part in forums where pupils from both Catholic and Protestant schools had the opportunity to share each others’ perspectives, challenge each others’ prejudices and even put our own politicians through their own interrogation processes in a public arena. What role is technology playing in Northern Ireland’s schools today? pilot within our school a new vocational qualification in Advanced ICT. We immediately knew we were on to a winner as the pupils excelled in the subject and, through collaboration with the local universities, we were able to identify relevant, achievable and sustainable pathways. It quickly became apparent to me that ICT could transform our student’s lives. For the past ten years I have championed the integration of ICT and e-Learning across all areas of the curriculum. In April 2010 we were awarded the prestigious UK Becta Award in acknowledgement of the richness of our ICT environment and the quality of our ICT learning experiences. We were also recognized as a Microsoft pathfinder school, and in November 2011 I represented the school at the Global Forum in Washington where we were awarded mentor status. Since then we have developed a close link with the ICT faculty in the University of Ulster. Their lecturers have provided accredited programming courses for our students in our new campus. I have widened our pupil access to all forms of digital media and we are beginning a new advanced Moving Image course this year. Next year we will be piloting advanced courses in Environmental Technology, Journalism in the Media and Communications Industry, Software and Systems Development and Space Science Technology. The University is also supporting the development of a games software programming course for our first-year pupils, all of whom will be provided with notebooks and access to Microsoft Overnote this year. I hope to achieve one-to-one pupil access by Christmas 2012. Celebrate the best of worldwide education! The Global Forum is the flagship event – a veritable Olympics for teaching and learning – for Partners in Learning, a key element of Microsoft’s recently announced YouthSpark initiative, in which we’ve committed to reach more than 300 million young people over the next several years. Partners in Learning helps educators and school leaders connect, collaborate, create and share so students can realize their greatest potential. It celebrates the world’s most innovative educators and school leaders for bringing technology to life in the classroom and impacting millions of students. Favorite childhood memory: Playing with my pet Labrador Brandy in the surf off the beaches of Donegal. Next Travel Destination: Qur Gite in the Dordogne in France for pleasure. 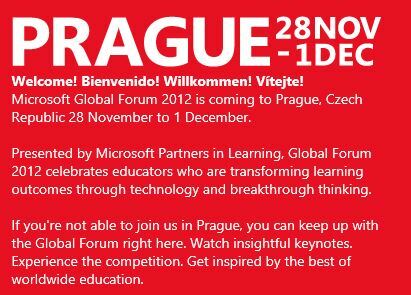 Microsoft Global Forum in Prague for business. When was the last time I laughed? I own an Irish Red Setter dog called Tessie so I laugh at least every half hour because of her. Favorite Music: Traditional Irish Music and anything by Eva Cassidy. This entry was posted in Beyond the Classroom, People and tagged innovative teaching strategies, Microsoft Partners in Learning, microsoft partners in learning global Forum, Microsoft Pathfinder School, PISA. Bookmark the permalink.